+This is not a DLC, it is a fully complete system. +This script works without DarkRP or any gamemode, and is compatible with all. Real-time management planning-combined with my time system. Days and hours work with all gamemodes; it's a system inspired by my own system. 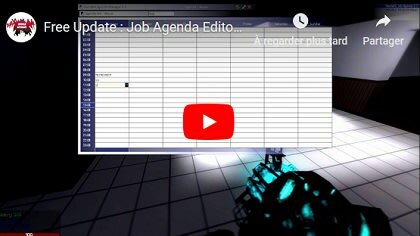 It has been rewritten for the management of some DarkRP jobs and student group management at RP School, since 2019 it is compatible with job categories, no need to create an agenda by job thanks to it. It was translated into 20 languages by the nice people. The hours of the day and the days of the week are automatically updated from Monday to Sunday. Your actual planning is written on a HUD at the top right, displaying the time and what is scheduled for that time for your job. So it's perfect for SchoolRP, Hogwartsrp, PoudlardRP, MilitaryRP, StarwarsRP and I forget. Editing of the name of plans on the timetable (jobs and/or groups). Ability to create multiple plans per group. Working together on the same timetable. Cycle of hours, minutes, secondes and days. Option to show/hide the 3D model. The Panel is already translated into 20 languages (Bulgarian, Czech, English, Estonian, Finnish, French, German, Greek, Italian, Japanese, Korean, Latvian, Norwegian, Polish, Portuguese, Romanian, Russian, Spanish, Swedish, Turkish). [Automated] Week cycle from Monday to Sunday. Planning - Option - [Admin]Set the days with hours. Planning - Option - HUD in the corner of the current activity. Planning - Option - [Admin]Select number of plans you want on your server. Planning - Option - [Admin]Set the names of plans - can be a group or a job. Planning - Option - HUD draw (ON / OFF). Planning - Option - [Admin]Give name of planning can be a Group or a Job. Planning - Option - Language Selection (Bulgarian, Czech, English, Estonian, Finnish, French, German, Greek, Italian, Japanese, Korean, Latvian, Norwegian, Polish, Portuguese, Romanian, Russian, Spanish, Swedish, Turkish). Planning - Option - Time format (AM/PM or 24 hours format). Planning - Option - [Admin]Virtual Conversion Time. Real-time backup that prevents data loss in case of a crash. Tired of picking up commands here? Then use this new script(Scripts Command Center) Use all commands in one unique interface. My script is compatible with the Atmos (weather, day and night addon). Tired of typing commands for night and day? You don't have to, it is automatic. ✔️ No knowledge in scripting to know how to use it. ⚠️ Never share your server access codes when a developer asks you for help. It's, most of the time, only to see your addons and steal or leak them to harm their competitors, because they have no respect for poeple other than themselves. A good dev who knows what he's selling he doesn't need your FTP access. I will never ask you for your access codes or any passwords, I have no need for them. -About me, I am attentive, responsive and serious, maybe too much for some platform. I have projects, a family and a simple life. I create everything myself and work allows me to live, my scripts are the result of research and contact with my clients. Ideas are not stolen for money, my scripts are mostly the first in their style each time. I have a lot of respect for creative coders. Believe my serious buyers who are also the ones who contribute to improvements and translations. -To Leak the author's job is to destroy their work and prevent their scripts from becoming even better.Thanks do not bring food on the table. -By using the leaked scripts on the other sites you are exposed to the malware, virus, backdoor, you have an outdated version not optimized and not fixed to the updates of Garry's mod, I always update my scripts. Keep in mind when something is free it is that it is you the product. -The majority of people who leak other people's script have a need for recognition and power. Don't give them the recognition they need. -The use of the leaked versions of my scripts for the business context is strongly discouraged. -⚠️ No Refund when it's downloaded, read the rule about it. The scripts I put here are used on my 13 servers before and tested. Maybe somewhere else you don't, but here I believe in your seriousness.